Pediatric Patient Safety: Enable Precise Epinephrine Dosing for Anaphylaxis from Neonate to the 0.3mg Dose with Certa Dose® - MED Alliance Group, Inc.
During critical times, healthcare providers must think on their feet, especially when dosing a pediatric patient. This usually involves doing math in their heads while under extreme stress and time constraints. Even with extensive training and repetition of these calculations, errors can still occur, leading to critical and fatal dosing errors. A Seattle Children’s Hospital nurse of 24 years made such a mistake. Instead of dosing her pediatric patient 0.14 grams, a 10x overdose of 1.4 grams was given2– a simple but deadly miscalculation. Pediatric patients are three times more likely to fall victim to an accidental critical dosing error.3 Taking care of smaller patients can be tricky when dealing with dosages because even the smallest medication error can have terrible consequences. Medical professionals aren’t exempt from human error, but fortunately there are devices on the market designed to help reduce critical dosing errors. Autoinjectors are a popular FDA-approved device for treating anaphylaxis, but most common 0.15 mg autoinjectors are appropriate for use in patients who are 15-30 kg and are not indicated for use with patients under 15 kg. 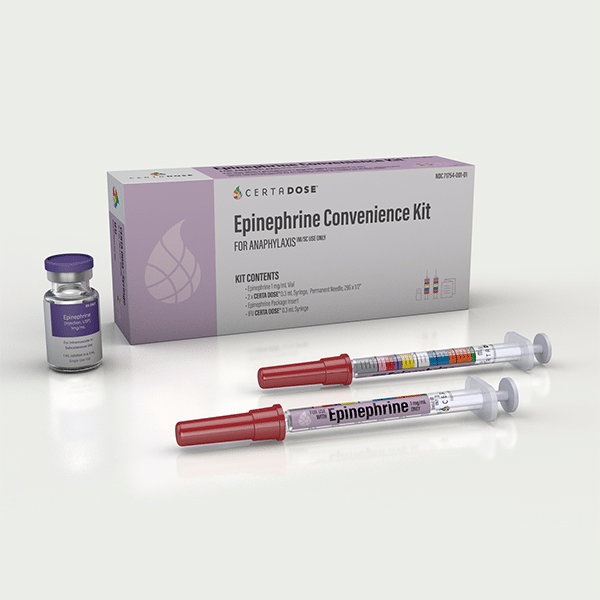 The Epinephrine Convenience Kit from Certa Dose® allows for precise epinephrine dosing for anaphylaxis from neonate to 0.3mg. Each kit features an FDA-cleared syringe labeled with easy-to-recognize color zones that match a widely adopted standard pediatric color coding system for weight. The Certa Dose syringe gives clinicians confidence when administering critical medications. To learn more about the Certa Dose® Epinephrine Convenience Kit, please email us or call 888-891-1200 to be connected with your local MED Alliance Group sales representative. Due to the nature of this product, orders must be placed through Concordance Healthcare Solutions. Current Concordance customers may login and place an order by searching SKU # 278950. All others, please call 800-473-2332. MED Alliance Group is an ISO 13485 certified medical device distributor with more than 350 years of combined medical device sales and distribution experience. Dedicated to meeting the needs of its clinical customers and manufacturing partners, MED Alliance offers cost effective, customized sales, logistics, and distribution solutions for products found in anesthesia/respiratory, blood/transfusion therapy, EMS/emergency room, interventional radiology/cath lab, iv/vascular and NICU/PICU. Please follow us on LinkedIn, Facebook and Twitter for MED Alliance product updates. 1 Journal of Pediatric Nursing, U.S. National Library of Medicine, www.ncbi.nlm.nih.gov/pubmed/23290866. 3 JAMA, U.S. National Library of Medicine, 25 Apr. 2001, www.ncbi.nlm.nih.gov/pubmed/11311101. What if You Could Receive Funding for Disaster Preparedness? September is Sepsis Awareness Month: Are You Prepared to Quickly Treat a Sepsis Patient? Is Your Hospital Ready for an Evacuation?